The JSA State of charge sensors are special purpose refractometers designed for lead acid wet cell battery use. 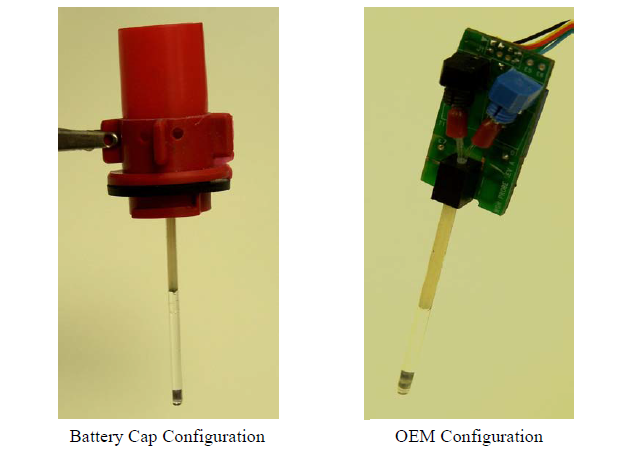 These inexpensive units will accurately determine state of charge levels in the cells of an open port batteries and may be easily adapted for use in sealed wet batteries. The sensor requires 5 VDC regulated input however an on-board regulator option is available enabling the user to supply power from a battery or other unregulated 6-35 VDC source. The sensors provide an analog DC output voltage of 1 - 4 V approximately proportional to the state of charge which may be calibrated in any user convenient units including specific gravity. And a second analog DC outputvoltage of 0 - 5 V for the tempreture. Nominal output at room temperature 2.5 volt. 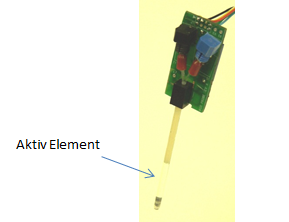 The sensor active element must be fully immersed in the electrolyte for satisfactory operation. Users may calibrate the sensor in % of SOC or specific gravity. We ordered two different types of the Sensor as you can see on picture 3. The Sensor is produced in the USA by the company JSA Photonics.